Today is bad omen day, or “I told you so” day. Julius Caesare apparently was warned of the treachery that awaited him at the Senate–many times and ways–yet he remained in denial, denying even his own gut feeling that the nasty-liver-missing-heartless entrails of a dozen or more sacrificed beasts did not bode well. 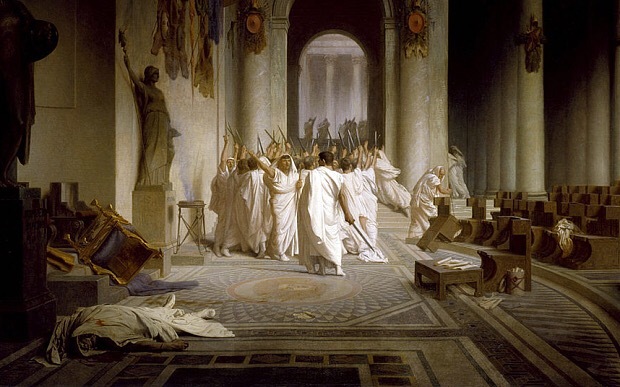 According to UK’s The Telegraph, The Ides of March: The assassination of Julius Caesar and how it changed the world, Caesar was warned by an entrails reader that ill fortune awaited him. According to this account, Caesar actually died with an unopened scroll in his hands, given to him by a messenger warning him of the treachery. But nooooo, he had to go to show good appearances, at the beckoning of his so-called friends and countrymen. For drama’s sake, Shakespeare spiced up Caesar’s departure with parting words, “Et tu, Brute?” and anyone who knows anything popularly about Caesar’s death, probably knows it through Shakespeare’s play, required reading in many high schools and undergraduate college courses. Doomsday. I hope not. My father has a doctor’s appointment today in preparation for surgery. The innards of my breakfast cereal looked okay this morning, however. I think it’ll be all right.